Beautiful modern villa ideal for families/golfers. Rates pegged at 2018 prices! 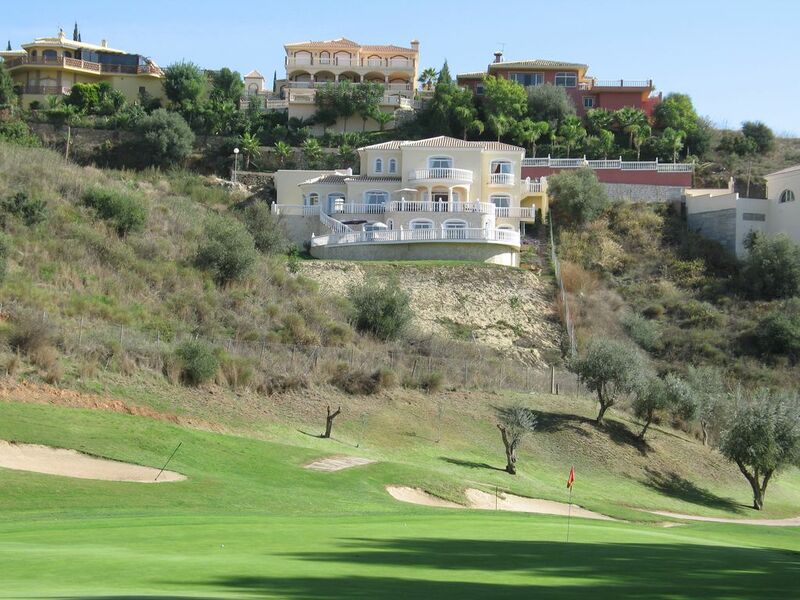 The Villa Maxamilliano is laid out three floors with breathtaking views of 13th green at Los Olivios Mijas Golf. It is south west facing and has also spectacular views to the Mountains. A short video will be sent to you when enquiring about the villa that cant be put on this website as it has music on it. Guests are given comprehensive directions to the villa and one of our team will be there to welcome you and give you a guided welcome tour. Meals indoors can be organized by independent caterers at the villa if you fancy soaking in the marvelous views as the sun goes down over the mountain late into the evening. I live and work in England with my wife and family. I am a long way from retirement!! I am very proud of the villa. It was completed in 2004 and we have spent many fantastic holidays there. I am a golf nut, so it is a real buzz to watch the players putting out on the 13th at Mijas Los Olivios. We are surrounded by some of the best golf courses in the world and just a short drive from the beach and a wealth of marvelous restaurants. I still have to pinch myself when I am on the terrace in the sunshine watching the family in the pool, the golfers, the fantastic views of the Ronda mountains and a chilled glass of white Rioja in my hand at the same time! It is really great that other people get to enjoy it through the rentals. We try and make sure you have a top holiday to remember!! Yes pick your own lemons for your gin and tonic! Terrace has a beautiful dining area with marvellous views. Villa Private Heate Mijas is a fantastic house with marwellous facilities and great views! Villa Private Heate Mijas is a great property with fantastic facilities and marvelous views! We really recommend the villa to other people! A lovely, spatious and comfortable house. Giving opportunity to really relax and socialize. We spent a sunny week in Andalusia, with lots of time by the pool and by the sea. During evenings the house provided good cooking possibilities which we much enjoyed since we're all foodies. Eating out on the porch in the cool mediterranean nights was very pleasant. A new music quiz was also prepared for every dinner! Fabulous villa for a 2 week holiday! We have just returned from a 2 week holiday staying in villa max, and we had an amazing holiday! We can’t recommend this villa enough and we will definitely return! There were 12 of us there and the villa was so spacious you were never on top of each other infact most of the time u wasn’t sure where each other was! It was so well equipped and there wasn’t anything that we needed that the villa didn’t have! The kitchen was big and had everything I needed to cook a meal for 12 people comfortably even with others standing round chatting and having a drink whilst I did so! The pool was fabulous and even with 12 of us in there was plenty big enough! And it always stayed crystal clear! Location wise it’s all fab! Your 10 mins from la Cala , 15 from Fuengirola and about 30 from Malaga! Lots of local restaurants! We had a car so was no problem getting to these places but you can also call a taxi and we found they were there within 10 minutes! You are also on the 13th hole of the golf course and have many courses around you too, my husband and son played on 3 courses which they said were brilliant! Going back to the villa we all had a fabulous time , we would book again in a heart beat! THANKYOU! Great guests always become friends and we are always very happy to see them return. We have many returning guests over the years! We look forward to having them back and its also a credit to my management team who work very hard in making sure people get maximum enjoyment from there well earned holiday! Amazing hen weekend in a fabulous villa! We have just returned from a fabulous 4 nights in Villa Maxamilliano. There were 15 females for a hen party. The villa is in a fabulous location, quiet area but not too quiet. We could play music etc. And not worry about disturbing neighbours. They organised transfers to and from the airport for us. We had a big food shop delivered to the villa and all put away ready for our arrival. We were €15 in a taxi to fuengirola and Olivia’s la Cala do not far at all from lots to do. Julia & Paul we’re on call at any time to help with any problems. We reported an issue with the AC and they were on site to have a look. The villa has everything you need, the kitchen is more than fully equipped. There is a massive bbq out the back - but charcoal & fire lighters if you want to use this as we were not aware of this. The sun is at the pool side from around 9am until 7/8pm at night!! Could not get the surround sound system working but despite this we had an absolutely fantastic stay and would definitely return! Highly recommend!! Once again fantastic guests who really enjoyed themselves! Very respectful and appreciative of our fantastic property and location. Perfect clients! We look forward to them returning in the future. The Villa Max team have worked very hard over the last ten years to make sure all our guests enjoy their very well deserved break to the maximum. Large groups, Large families, groups of friends whatever the mix. They always get a great buzz from the fantastic reviews that we receive regularly. A group of 16 of us stayed at the villa between 16/4/18 - 20/4/18 and couldn't have asked for better hosts, they bought our food and drink in advance for a small charge, showed us around the property and provided us with everything we needed for our stay, the villa itself is beautiful, looking onto the golf course. we used taxi's to the beach which cost about 12 euros. overall I would highly recommend staying here and I look forward to booking again! For those who are new to the area, you will be generally met at your chosen car hire office at Malaga airport and then personally guided into the villa by my property manager. Where you will then be given a guided tour of the villa by one of our staff who will be your point of contact during your stay. The estate also has two beautiful golf courses suiting golfers of all abilities and boasts the five star Byblos hotel and spa with its two luxury cordon bleu restaurants. The area also has many other famous restaurants like El Oceano,Val Paraiso and El Higueron. .